We have seen analysts making their bets on Apple’s forthcoming quarterly results and iPhone sales, but how do the iPhone 5c and iPhone 5s adoptions look? The handsets are now available in 46 countries, but 35 of them were added just several days ago. Localytics takes a look at the adoption data in the 11 countries measured initially. 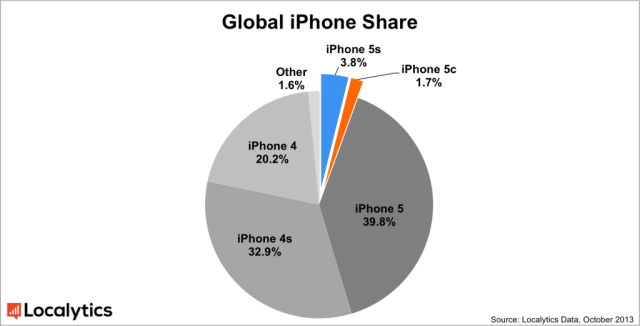 The market research company has found that the iPhone 5s and 5c currently represent 3.8% and 1.7%, respectively, of all active iPhones on a global scale. The iPhone 5 holds the biggest stake, 40%, followed by the iPhone 4s, with 32.9%. What’s interesting is Japan’s position compared to other countries where the iPhone 5s and 5c launched: Localytics has found that the country has the highest concentration of active iPhone 5s and 5c handsets, as they represent almost 10% of all active iPhones, followed by the US, with 6.4%. The average stands at 5.5%. Compared to the first report claiming that the iPhone 5s outsold the 5c by a ratio of 5 to 1, the image looks slightly different now: As it turns out, buyers from Germany prefer the high-end model over the colourful version. Another interesting highlight of the study: The US is the most iPhone 5c friendly country of all.